Are you looking for ways to earn some extra money, or perhaps change your career while doing what you love? My name is Frank W. Pandozzi. 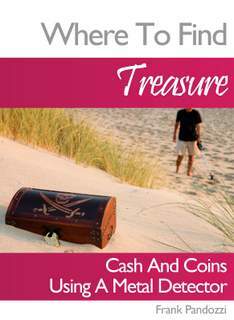 For 40 years, I have been a treasure hunter earning an income from my hobby, and I'll show you how with my book! BE SURE TO SEE THE SPECIAL "BUNDLE PACKAGE" PRICE BELOW FOR ALL OF MY BOOKS. All of my books are ebooks - digital books for easy download. "Thank you so much Frank the books are awesome with some really great ideas "
"Congratulations Frank. I have enjoyed and learned much from your TV show, web sites, Blog, writings, and personal contacts. I hope more adventures are soon to come." "WOW! Frank! 5 Ways was great reading. I will definitely use some of the ideas. Thanks for opening up an entire new world of detecting for me." I’m mentioning my experience in the hobby to let you know that you can earn money, and change your life by using your metal detector, just as I did. I began in the hobby of metal detecting, probably the same way you did. I purchased my first metal detector, and then went out and dug piles of pull-tabs and tin foil. However, as time went on, I became more involved with the hobby, and I read more books about metal detecting/ treasure hunting. That was when I realized that I could earn some extra cash using my metal detector. I have never been the one to stop trying new ideas, so throughout the years, my abilities to earn money from treasure hunting increased. My experiences have given me the lifestyle I always wanted. If you have this kind of dream, if you would like to earn some extra money, or become a professional treasure hunter, then I am here to tell you that you to can do what I’ve done. 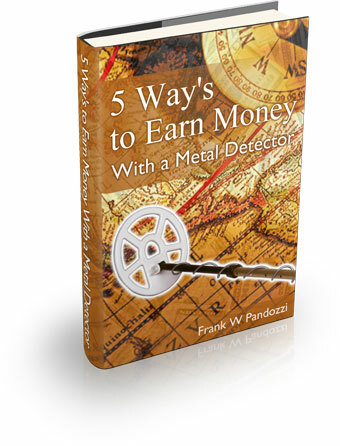 I will show you 5 exciting ways to turn your hobby into dollars, using your metal detector. You will learn how to approach people to earn that money. I will show you what places to go to earn those extra dollars. You will also read about how one ad produced more than $5000. In addition to the above ways to earn, you’ll learn how to gain access to areas for metal detecting that you thought you never would enter. As I mentioned earlier, I am not the only treasure hunter who has been earning a living from doing what I love. I have met other treasure hunters who are living lives that I admire. They also started the same way I did, by first owning an inexpensive metal detector and then moving on from there. My ebook is written from many years of experience. You won’t have to make the mistakes that I made along the way. If you follow my advice, and never listen to the naysayers who are always there to “rain on our parade,” then you can live the life of a professional treasure hunter also. "Frank, just a short note to tell you that I've earned back the price of your book, which was not much, by doing what you said to do. And I expect to earn lots more. A BIG time thanks!!! BUY NOW at this time sensitive low price of $1.99, or view the special "bundle package" price at the bottom of this page. And here's another one of my ebooks just filled with great info to help you find more stuff. If you have any questions or problems please use the "Contact Me" form . Buy all of my Ebooks for just $9.95. In addition, you’ll also receive the links to my metal detecting TV series. 13 links, one for each half hour show. That’s a $8.95 value by itself. This BUNDLE PACKAGE of the 5 Ebooks, and the links to my TV series is just $9.95. Scroll to the bottom of the page to buy this package. The regular price for this package is $49.95... You save - $40.00 when you buy the entire package. Use the secure “Buy Now” button at the bottom of this page. If you have any problems with the downloads you can reach me by email. You’ll get a confirmation with my email address when you purchase. Or, you can use the “Contact Me” form here at my website.